The Series 150 & 150K Flowmeters offer precise measurement of gas or liquid flow over a wide range of flow rates at low pressures. Suitable for plant and laboratory use, they are widely used in gas chromatography, atomic absorption spectroscopy and process control. Each flowmeter consists of a replaceable glass metering tube and two standard floats (glass and stainless steel) which expand the range of the flowmeter. 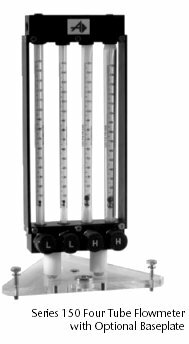 The linear scale allows each flowmeter to be used with a variety of gases via a calibration chart (see "Calibration" information box). Tube selection depends on the gas being metered and the range of flow rates required. See Tube Selection Table. Two Floats per Tube (Standard) expand range of flowmeter. Ribbed Tubes stabilize floats and improve accuracy and readability. Borosilicate Glass Tubes allow operating temperatures up to 250°F (200°F for Series 150K). 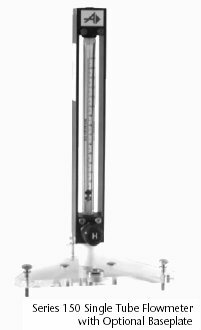 Linear Scale (10-150 mm) allows each flowmeter to be used with a variety of gases via a calibration chart. Availability of Aluminum, Stainless Steel or Kynar®Construction provides a wide material selection for maximum gas compatibility. * Series 150K Flowmeters may be front panel mounted using predrilled holes on rear of flowmeter and self-tapping screws. Sapphire, Carboloy or Tantalum Floats allow range of flowmeter to be changed without replacing the tube. Aluminum Bezel permits flush panel mounting. Inlet Filter traps foreign matter, extends flowmeter life and reduces maintenance. High Accuracy Valve with Non-Rotating Stem (NRS) allows very fine adjustments to flow settings. Standard (± 5% accuracy) calibration is performed using Air at normal temperature(70°F) and pressure (14.7 psia). Calibrations for gases other than Air are mathematically derived from the Air calibration. Calibration charts for Air are shipped with each flowmeter or replacement tube. Calibration charts for many other gases and gas mixtures are available at no additional charge. Specify the required calibration charts when ordering. The accuracy of this calibration is ± 5% of full scale. * * Specify gas, temperature and pressure when ordering a ±1% calibration. Please note the accuracy for tube No. 1 is ±2%. Where "( )" is indicated above under "Single Tube Flowmeter," complete the part number by inserting applicable tube number from Tube Selection. Example: FM4300-1. Order by complete part number. Where "( )" is indicated above under "Four Tube Flowmeter," complete the part number by inserting four applicable tube numbers from Tube Selection. Place the desired tube numbers in the order in which they are to be installed in the flowmeter, from left to right. Example: FM4601-2314 for tube nos. 2, 3, 1 and 4. Order by complete part number.